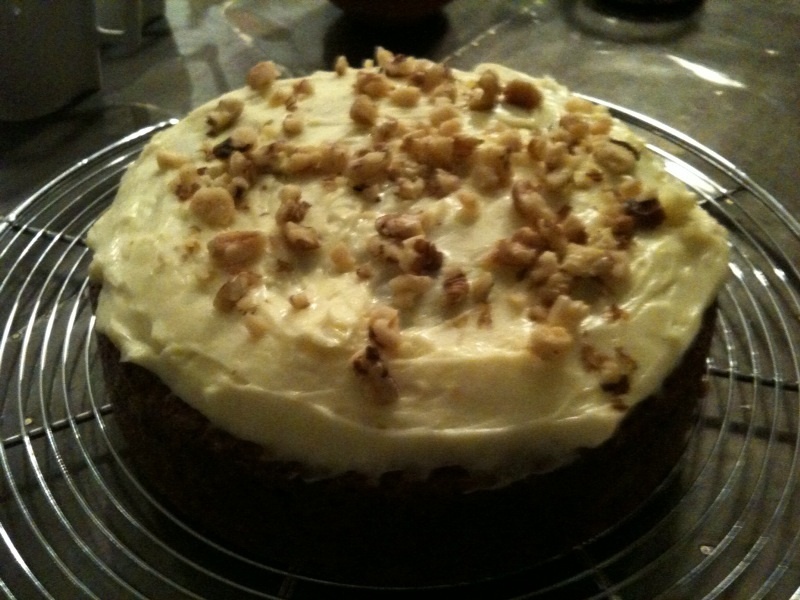 here is my first attempt to bake a carrot cake with cream cheese frosting. i found this recipe on a japanese cooking website called クックパッド (“cookpad”). i actually love using the website, as i can find a number of recipes on a search engine (e.g. google) by merely typing some names of ingredients that are leftover in the fridge or kitchen shelf. i also love it because it makes me feel as if i am being very efficient, not wasting any food. in the past, this activity was not very feasible using cooking books. i could use index pages, but there was no guarantee that i could find recipes with the ingredients in question. as a result i had to go through several cooking books, which was quite time consuming (especially because of the fact that i love going through cooking books and admiring the images and texts of beautiful inventions, and forgetting the initial reason why i started browsing the books in the first place). anyway, back to my carrot cake. the other day i bought a pack of carrots for a dinner, but when i got back home, i decided to change what i was to cook, and the poor carrots were left unused. a few days later, i suddenly remembered that i had the carrots in the fridge (do you usually keep carrots in the fridge or outside the fridge?). i had always wanted to bake a carrot cake dense in texture and with cream cheese frosting, so i sat in front of my mac book, typed in “キャロットケーキ (carrot cake in Japanese)” on google, and boom! i got 3 recipes on the cookpad. it came out as exactly the type of carrot cake that i had pictured earlier. thank you very much “konomin” for sharing your great recipe!